Happy New Year! This marks the final monthly post tracking 2018’s reading, and I’m actually proud that I “reviewed” every book I read in regular posts. This will definitely continue into 2019, which I kicked off by finishing such an enjoyable YA book (I know, a little off brand for me!). You’ll hear about that read next month, but for now, here is what I managed to read amidst the holiday craze in December! I would rate this a 3.5 star read. McCoy took on the challenge of writing about what exactly happened to Marilla Cuthbert and her romance with John Blythe long before Anne Shirley came to Green Gables. I didn’t manage my annual reread of Anne of the Island in 2018, and thanks to its impressively similar tone to L.M. Montgomery’s work, Marilla of Green Gables made me want to pick up the original series again ASAP. The book begins when Marilla is quite young, continues throughout her teens, and then jumps to a little more than a decade before the start of Anne of Green Gables. In addition to Marilla’s romance, it focuses on Canadian politics, abolitionism, and Marilla’s intensely loyal bond with her family, particularly her brother Matthew. While this was such a sweet story that definitely melded well with Montgomery’s canon, it felt a little rushed the older Marilla got, and the ending felt particularly speedy. Marilla basically disappears from the original books after Anne gets married, and it would’ve been nice to see McCoy present her version of Marilla later in life. I think being in such a familiar world with different or much younger characters might’ve thrown me off, but I would still recommend this to any Anne fans! News flash: reading when you’re no longer a student is the best. When I was in college, I always had my Kindle with me, but I felt guilty whenever I tried to read for pleasure. There was homework to do! Applications to fill! People to see! Now that I’m more than a year into my “adult” routine, I still manage to get a lot of reading done even when I think I’m devoting little time to it. Plus, I just get to read what I want to, and I’ve become totally comfortable with deserting books if I’m not loving them. I feel so passionately about my favorite reads of the year (check out the posts for my picks in 2014, 2015, 2016, and 2017). Honestly, if I had to pick a few books that sum up my interests and personality at this time of my life, the six titles below are probably the most accurate representatives. It’s just the best feeling ever when you find books that feel so specifically catered to you, and I feel lucky to have found these along the way in 2018! Disclaimer: these are books I read for the first time in 2018, not necessarily ones published this year (although, I believe the majority of them actually were!). Jacquelyn Middleton won my eternal love when she wrote two amazing contemporary books set in London and featuring an American’s perspective. Her standalone third book, taking place in New York City, was just as wonderful. If you’re looking for books about characters in their early 20s as opposed to being teenagers or older adults, Until the Last Star Fades is a perfect new adult mix of independent people who are still trying to figure it all out. Middleton’s first two books excelled in pop culture references and creating a world that already felt so familiar to me, and and she pulled off the same in Until the Last Star Fades. Someone tell me where I can find boys like her Ben and Mark, okay? My holiday plans never require me to go too far from home. Our extended family is both minimal and local, so on days like Thanksgiving, my family and I are usually back in our PJs by 8 p.m. and delving into movies or books for the rest of the night. My low-key holiday break last month meant I had plenty of reading time, and after a stint of feeling very meh about the books I finished, November finally delivered with some fantastic reads! I had some of the books below pre-ordered or on hold for what felt like forever, but they were well worth the wait. You can expect to see one of these appear in an upcoming post on my favorite books of the year! I downloaded this in a moment of impatience when my library holds seemed perpetually stuck on the #1 spot. I’ve read another Kate Middleton biography in the past, but this one is by Katie Nicholl, a very reputable royals reporter. Following Kate’s life right up to after she gave birth to Prince George, the book is definitely the most comprehensive take on her that I’ve read. It included details about her family and her relationship with Prince William that I never heard before, and you’d be hard-pressed to find some royal dirt that I haven’t come across. I finished this before all of the recent stories about Kate and Meghan Markle feuding emerged (I think the reports are exaggerated and come from a slightly misogynistic media perspective). Given that news, thinking about the royals has stressed me out lately, but Kate: The Future Queen was the perfect definition of easy, breezy reading. Yes, I know what’s going to happen, but it’s nice to just jump into a non-fiction story that has a happy ending. September started out as a slow reading month. I hadn’t found a book I absolutely loved in forever, but after starting a Netgalley account toward the end of the month, my slump definitely improved. I’m still having some trouble with reading consistently, but I think the more the fall season progresses, the more books I can get through. Colder weather means more of an excuse to stay inside and read! Part of what initially delayed my book count this month was attempting to read The Kiss Quotient and The Wedding Date. These two books have gotten so much hype in the blogging community, and initially, it looked like they would live up to those high standards. I loved that they both had unique heroines and, particularly in the case of The Kiss Quotient, provided insight into the minds of people who are rarely highlighted in fiction. But other than focusing on underrepresented perspectives, the overall stories weren’t very remarkable or investing to me. I couldn’t get on board with either author’s writing style, basically confirming to me that lately I crave stronger writing in order to really enjoy a book. I ended up abandoning both books about halfway through. I wanted to like them so badly, but they just weren’t for me. Luckily, my September reading material drastically improved after I left the books behind. Life is too short to read books you’re not enjoying! Count this as more of a 3.5-star read. Authors never come to bookshops near me, so when I found out Kristan Higgins was making an appearance to promote this book at a new indie bookstore 15 minutes away, there was no way I was going to pass up the opportunity to see her. Good Luck With That follows Marley and Georgia after their longtime friend from weight loss camp, Emerson, passes away from complications with obesity. Her death inspires the two women to achieve the simple goals they all listed as teens and assumed were only attainable if they were skinny. The conversation about this book online and at the signing was definitely multifaceted and opinionated. Addressing weight and body image in a way that helps people relate to book characters rather than feel isolated from them is complicated, and you can’t please everyone. While I’ve never had problems with my weight, I’ve always had on-and-off struggles with my self image and liking the way I look. Georgia and Marley definitely expressed some of my own feelings about self-esteem, but overall, this wasn’t my favorite Higgins book. The writing, setting, and family relationships didn’t stick out to me as much as past reads have, but the book’s focus is definitely a good conversation starter. Happy August! I had a pretty great reading month in July. Within the first few days, I finished a non-fiction book I started in the last week of June, read the perfect romantic comedy to go along with the summer season, and returned to the YA genre for the first time in years. In the later half of the month, I encountered some books with slower, more unexciting paces, but finished July with a beautiful book that totally won over my English major heart. Some of my early reading plans for this month include picking up Crazy Rich Asians and Curtis Sittenfeld’s short story collection, and I have some fun-sounding books on my Kindle that I bought through my Amazon ebook deal emails. July was definitely a month of preferring to read rather than watch TV or movies. so we’ll see how August goes. Until then, enjoy my insights on the seven books I read in July! I get that it’s way too soon to read a book about Prince Harry and Meghan Markle that really gets it. I think the reason the only royal family biography I’ve finished and really loved was Sally Bedell Smith’s Elizabeth the Queen is because so much of the Queen’s life and reign is already behind her. Delivering a book that feels comprehensive and accurate about any other member of the family is trickier because they’re either still too young or haven’t risen to their full power yet. Wouldn’t you rather read a biography about Prince Charles that handles how he took over his mother’s role as ruler rather than what he’s been doing the past decade to pass the time? That being said, while reading this, I did learn a lot about Meghan’s upbringing and young adult life that I didn’t know before. The craziness of her love story with Harry still gets me every time. This book shifted between Harry and Meghan’s lives and what they were doing at parallel moments, eventually culminating in how they met and became engaged. Seeing as it was published before the actual royal wedding, the book flanders a bit at the end, hence the lower rating. I saw this debut author speak at Her Conference on a book-writing panel last summer, and since then, we now work for the same company. I’ve never met her, but I definitely recommend following her great Twitter feed. Based on Orenstein’s own experiences working as a New York City matchmaker, Playing with Matches is about a recent college grad who snags a matchmaking job in Manhattan out of desperation. Working with much older and experienced clients, she basically has to fake it till she makes it. When her longtime boyfriend betrays her, one of her client’s hunky matches may soon complicate the professional approach she has to maintain over her clients’ love lives. I’ve been so distracted with work and other writing projects that I’ve definitely been putting off a recap of my June reads. Plus, I’ve delved into such enjoyable books this month in July that the books below haven’t exactly stuck out that much since I finished them. It wasn’t until the end of the month that I realized most of what I read was non-fiction, but it seems that I’ve recently gone through phases of preferring non-fiction or documentaries over literary fiction and TV shows. Anyone else feel that way every now and then? July has already gone down a significantly different path in terms of what I’ve read. While I’m so excited to eventually share what books I’ve read in the past two weeks or so, here’s what I have to say about the five books I read in June. I received this memoir / literary critique for Christmas a few years ago, and while I read about half of it soon after getting it, I never picked it up again. I rarely buy books because of a lack of storage, so I’ve been trying to chug through the stories on my shelves that I somehow haven’t read yet. McCabe’s book follows her adult journeys to the real-life settings of her favorite childhood books, such as Laura Ingalls Wilder’s Little House series, the Anne of Green Gables books, and Little Women. She takes these trips with her young daughter, who is usually quite indifferent to the meaning of these locations, and looks at these classic stories from her grown perspective, often becoming disappointed with how problematic the stories actually were. Like many girls, I reread the Little House books so much as a kid, but as I’ve mentioned before, I love going back to the Anne books and try to reread Anne of the Island at least once a year. I’m also fiercely protective of Anne Shirley, and McCabe’s critique of those books didn’t sit well with me. I get that, as an academic, it was her job to be critical of the stories, but at certain points, it just seemed like she was finding reasons to complain. I did like some of McCabe’s insights, but I was glad to part with her voice at the end of the book. Who else thinks May is the official start of beach reads season? I don’t exclusively associate beach reads with bright book covers depicting the seashore or a woman in pink heels and, instead, I like to think of them as books that just make you happy. I love an engrossing, literary read as much as the next gal, but I just adore when the weather is finally nice enough to just sprawl out in a hammock and cruise through a well-written yet easygoing book. That being said, I definitely read my fair share of “happy” books this month, but I have some more serious reads planned for June. I have Celeste Ng’s Little Fires Everywhere ready to go on my Kindle, and I’m also hoping to get through The Handmaid’s Tale and the new Robin Williams biography this month. After recently finishing the TV series Home Fires in the course of a single weekend (I was obsessed), I’ve also been reading its novelized continuation, Keep the Home Fires Burning. As for May’s reads, I’m so proud of what I got through. All of these books were easy to dive in and out of, helping prevent any reading slumps and motivating me to seek new books when the time came. Keep scrolling to see what I thought of each individual read! Mark this one down as an actual 4.5-star read. 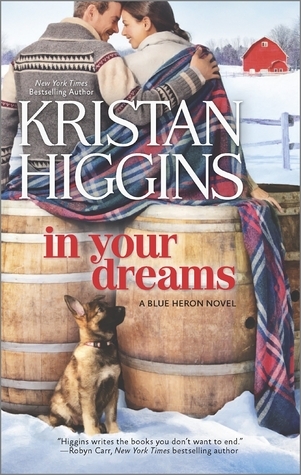 I selected In Your Dreams from my library Overdrive without knowing it was a later book in a series, but I went into it knowing enough praise about Higgins to feel positive about it. Given the details allotted to certain secondary characters, I quickly figured out there were other books about the main characters’ friends and family, but I became so invested in the story of Jack, the beloved only son in a family of vineyard owners, and Emmaline, a lonely neighborhood cop who’s in need of a date for her ex-fiancé’s wedding. Tortured by what he did in a recent local accident, Jack agrees to accompany her for the big day, but their weekend away introduces a romantic streak between the pair that Emmaline isn’t quite ready for. On the surface, it sounds like an often poorly executed Hallmark movie but, apart from a somewhat abrupt happy ending, I loved Higgins’ writing. She built the characters of Jack and Emmaline so well through backstory and witty dialogue, and I fell in love with their small upstate New York town. I also liked that the book’s “conflict” actually happens quite quickly, allowing the reader to learn more about Jack and Emmaline in their normal, everyday setting rather than the heightened situation of said conflict. The book’s strong writing style and the lovable dynamic of Jack’s family convinced me to read the rest of the Blue Heron series, or at least Jack’s sisters’ stories. As you’ll see below, I didn’t wait too long to check out one of the other books! Sooo April’s reading was not that diverse. I read three nonfiction books, two of which related to The Bachelor, and four books in total, three of which were written by authors named Amy and all of which were written by women whose first names started with A. Looking back at my month, those are funny little coincidences, but the lower number of reads isn’t too surprising. I had a busy month, but warmer weather always seems to help me breeze through tons of reading, so I have high hopes for May! I’ll wolf down a World War II story like nobody’s business, but I’ve never come across one set in Italy like From Sand and Ash. Even more specifically, the book delves into how Italian Jews were affected by the Holocaust, which I’ve never heard anything about before. Growing up in Florence together, Eva and Angelo are best friends who could’ve been something more, but Angelo follows a calling to priesthood, while Eva can’t pursue a career in music thanks to wartime laws against Jews. Both become involved in guiding Jews to safety and hiding them within Catholic convents and churches, which is truly how a lot of the country’s Jews managed to make it through the war unscratched. I’ve read way too many World War II stories set in France, so I was excited for this more unique take on the wartime experience. It lacked a little something that made me absolutely love it, but it’s a great story!